Just because it’s winter doesn’t mean you have to give up your training. If you’re made of tougher stuff than I, you can continue with your hunting training. I’m sure our active hunting members would be happy to help you with that. K9 Nose Work is the new up and coming dog sport. It basically teaches your dog to become a police drug dog but without the drugs. Instead you start by having your dog search for food and eventually for three different scents, birch, clove and anise. I am working on getting certified as a K9 Nose Work instructor, but it is a long process. In the meantime I am practicing with my own dogs and my private students. I have found many benefits to Nose Work. It gives your dog a job–let’s them use their nose for good instead of evil, builds confidence, teaches creative problem solving, helps your dog conquer their fears if they are afraid of moving things and helps build a great relationship between you and your dog. 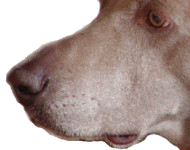 You can work towards titles in Nose Work through the National Association of Canine Scent Work. There are three levels of titles. So far no one has achieved the highest level title. Go to their website, www.nacsw.net, to find out where to go for classes near you. Scatter a few treats on the ground and say FIND IT. Point to the treats if necessary. Repeat several times. Once your dog understands FIND IT means there will be a treat on the ground, toss one treat on the ground, say FIND IT, and while he is looking for the first treat toss a second treat behind the dog. Start hiding the treats in plain sight, right next to the leg of a chair or table and send dog to FIND IT. Make it more difficult by putting the dog on sit or down stay. Let the dog see where you are putting the first FIND ITS. Then gradually make it harder and harder. The dog must stay while you are hiding treats all over the house. You can also stuff and hide food puzzle toys to make the game last longer. Begin saving taller plastic or metal lids from products you use. Hide treats under these lids and let the dogs figure out how to get the treats out. The lids can be challenging to pick up for most dogs. They will have to use their brains to figure out how to get the treat out. Initially, play the shell game with two or three lids. Next begin hiding these lids all over the house and let your dogs find them and work to get the treats out. Aerobic exercise can be a challenge for your dog in the winter. One of my favorite things is to play Dog Stairmaster with Cassie. She will do 30-50 flights of stairs. I keep throwing treats until she wants to stop. To play Stairmaster, I recommend that you only play on carpeted stairs and with a dog with no joint issues. Get some yummy treats and start at the bottom of the stairs. Toss a treat to the top of the stairs and let them run up for the treat. Don’t give them the treat when they come down, just toss another treat up the stairs again. If the dog won’t come down the stairs, just walk away and stop playing. Repeat as often as you and your dog like. It takes the edge off a wound-up dog. You can also play by tossing toys if your dog is toy motivated, although I probably wouldn’t use a ball because it would bounce around too much and I wouldn’t want my dog leaping for a ball on the stairs. Let the dog win a lot. Keep sessions short, 2-4 minutes or shorter (maybe even 10 seconds), to keep arousal low. If one tooth even accidentally touches your hand the game is over. Get them excited and tugging for 10 seconds. If dog becomes overly aroused more quickly, stop sooner, even after a couple seconds. You can get the toy back in one of three ways. Ask for a DROP IT. A treat trade may be necessary initially. Freeze the tug against your body so there is no play in the tug. Don’t tug back, just hold it. It will not be fun for the dog because you are no longer playing, and they will let go. The second the dog lets go, you can immediately re-engage him in tug. This teaches the dog not to guard or play keep-away with the tug toy because he knows he will get it back right away most of the time. If you have a human treadmill you can always train your dog to trot on that. I put Cassie on the treadmill once or twice a week in the winter. You can view an old video of Maverick (R.I.P.) on the treadmill at http://www.youtube.com/watch?v=a-Onj8Avk-w&feature=email. If you’d like to train your dog to walk on a treadmill, contact me and I’ll tell you how to get started. At 9 months old, I discovered that my puppy Maizy seemed to be having behavior problems, which had not been displayed before. I didn’t see the early signs of anxiety and thought I was experiencing what I thought was a reversion to naughty behavior that sometimes happens when a previously well trained puppy reaches that age. Maizy had “earned” her way out of the crate because of great behavior. Then she had a dangerous “reversion”.